Wayne State University Press, 9780814345238, 456pp. Robin Wood-one of the foremost critics of cinema-has laid the groundwork for anyone writing about the horror film in the last half-century. Wood's interest in horror spanned his entire career and was a form of popular cinema to which he devoted unwavering attention. 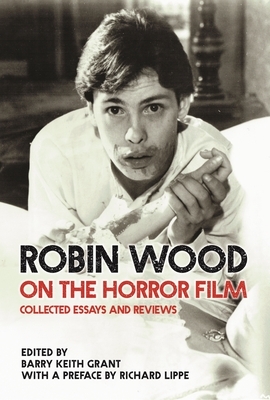 Robin Wood on the Horror Film: Collected Essays and Reviews compiles over fifty years of his groundbreaking critiques. In September 1979, Wood and Richard Lippe programmed an extensive series of horror films for the Toronto International Film Festival and edited a companion piece: The American Nightmare: Essays on the Horror Film - the first serious collection of critical writing on the horror genre. Robin Wood on the Horror Film now contains all of Wood's writings from The American Nightmare and nearly everything else he wrote over the years on horror-published in a range of journals and magazines-gathered together for the first time. It begins with the first essay Wood ever published, "Psychoanalysis of Psycho," which appeared in 1960 and already anticipated many of the ideas explored later in his touchstone book, Hitchcock's Films. The volume ends, fittingly, with, "What Lies Beneath?," written almost five decades later, an essay in which Wood reflects on the state of the horror film and criticism since the genre's renaissance in the 1970s. Wood's prose is eloquent, lucid, and convincing as he brings together his parallel interests in genre, authorship, and ideology. Deftly combining Marxist, Freudian, and feminist theory, Wood's prolonged attention to classic and contemporary horror films explains much about the genre's meanings and cultural functions. Robin Wood on the Horror Film will be an essential addition to the library of anyone interested in horror, science fiction, and film genre. Robin Wood was a founding editor of CineAction! and author of numerous influential works, including new editions published by Wayne State University Press of Personal Views: Explorations in Film (2006), Howard Hawks (2006), Ingmar Bergman (2013), Arthur Penn (2014) and The Apu Trilogy (2016). He was professor emeritus at York University, Toronto, and the recipient of a Lifetime Achievement Award from the Society for Cinema and Media Studies.Barry Keith Grant is professor emeritus of film studies and popular culture at Brock University in Ontario, Canada. The author or editor of more than two dozen books, Grant's work has appeared in numerous journals and anthologies. An Elected Fellow of the Royal Society of Canada, he is editor of Wayne State University Press's Contemporary Approaches to Film and Media Series.